Almost thirty years ago I first learned about the Freedmen’s Bureau and the Freedman’s Savings Bank (officially known as the Freedman’s Saving and Trust Company). While in college I was able to do further research on the legacy of freed Black slaves in America, and the one thing that stood in the way of their financial inclusion and the future of economic development in Black America more than one hundred years later— that one thing was FEAR. The southern white “establishment” was fearful of what inclusion and development of freed Black slaves would mean for them (the former slave owners), and whether or not the tables would be turned on them— if the human “property” they enslaved for more than 100 years finally decided to “get even”. The Freedmen’s Bureau and the Freedman’s Bank struggled and failed in 1874 (after 9 years) for many reasons, but what triggered their fall was the fear of seeing freed slaves rebuild their lives and join the competitive landscape of the country that they built through their own blood, sweat, and tears. How could the enslaved now have the right and financial capability to own land and property, live by, and exist at the same level or above the same people who had enslaved them? How could they be as or more educated than the people that outlawed slaves from being taught to read and write? I’m sure for many white southerners, this was tantamount to blasphemy. Today, the U.S. Treasury Department is celebrating and honoring the renaming of the U.S. Treasury Annex, back to its original name, the Freedmen’s Bank. Yes, what most of us did not know is that although the bank failed and shut down, the building in Washington D.C. (the relocated national headquarters) was never destroyed. No one struck a match to it or bulldozed it. It’s been here hundreds of years later staring at all of us. Isn’t that ironic? Fear is only capable of doing so much. It is not all-powerful. It can’t hide for long. It can only destroy so much, but mostly it destroys itself. 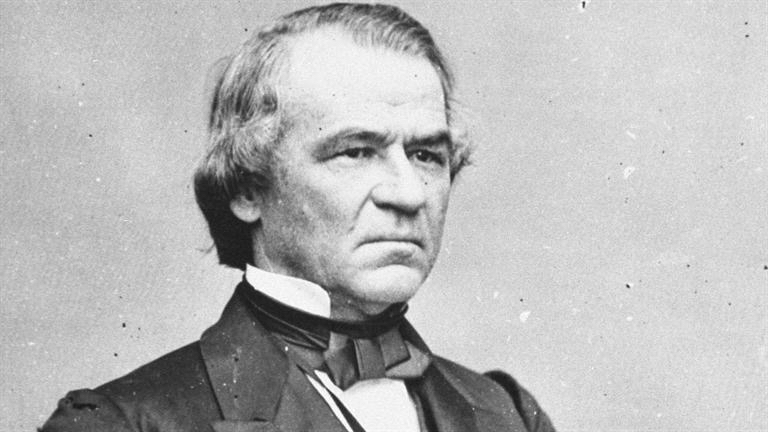 President Abraham Lincoln had a vision for the Bureau and the bank, but when he was assassinated in 1865, his Vice President, segregationist, President Andrew Johnson, had a different vision. Johnson vetoed Congress’ 1866 bill to renew the Bureau’s charter and found a way to watch the bank fail. Johnson was short-sighted. Johnson did not believe in financial inclusion of all. He did not believe in access to capital for all. He did not see the ultimate vision of how economic development for freed slaves would positively impact the south and the country as a whole. Johnson did not honor the emancipation of Black people. He did not honor the fact that the same rights of white people were also due to Black people. Inalienable rights are inalienable rights—except if you were born Black. Black people were good for making white southerners disgustingly wealthy, but there was no way that he and other segregationists were going to allow freed slaves to make and save their own money—and build that money into wealth. Imagine what our country would look like if Johnson (and others like him) did not fight so hard to disable the Freedmen’s Bureau and destroy the Freedman’s Bank. The Freedman’s Bank was originally headquartered in New York City, and the first branch was in Baltimore, Maryland. By 1866 there were 19 branches located in 12 states (mostly in the south), and in 1867 the national headquarters was moved to Washington D.C. The Freedman’s Bank had an estimated 37 branches, roughly 480,000 names are recorded as registered with the bank, and had more than $3.7 million dollars on deposit. That’s millions of dollars in 1874, can you imagine the equivalent of that amount today? The Freedmen’s Bureau’s purpose and aim was to help freed slaves gain a strong footing in a land that they helped to build, but previously had no rights or opportunities. The Bureau helped freed slaves obtain jobs, food, water, clothing, healthcare, reconnect with family members, and more. Out of the efforts of the Bureau came the mass enrollment of hundreds of thousands of Blacks in the south by the African Methodist Episcopal (A.M.E.) and the African Methodist Episcopal Zion churches, who sent missionaries to the south to form congregations and provide Blacks with alternative options to praise and worship God. One of the Bureau’s biggest accomplishments was helping former slaves gain access to education. They collaborated with missionary and aid societies from the North to help teach freed slaves how to read and write, and set up schools to make this possible. By 1865, there were almost 100,000 students enrolled in these schools. While thinking of basic education for freed slaves, the Bureau also knew of the importance of building institutions of higher learning, to provide high school and college training for interested students. In 1867 Howard University was erected in honor of Oliver Otis Howard, the Bureau’s commissioner. In 1868 Hampton Normal and Agricultural Institute was created. This institute is what we now know as Hampton University. By 1870 there were more than 1,000 schools in the South for freedmen. After the 1870s things began to take a turn for the Bureau as southern Democrats regained power in government and found ways to defund the public freedmen schools, and by the 1890s our country was plagued by Jim Crow Laws that found ways to create even more obstacles for freedmen in southern states. But even with these efforts, it did not stop the continued building and growth of Historically Black Colleges and Universities (HBCUs), many of which are still active and fully-enrolled today. The “Freedmen’s Bureau Preservation Act” was passed in the year 2000 by Congress, which directed the National Archivist to preserve the extensive records of the Bureau on microfilm, and work with educational institutions to index the records. In 1874 there was a group of people who thought they succeeded at financially, spiritually, and emotionally crippling freed slaves. In 1874 there was a group of people who thought they succeeded at destroying and erasing a beacon of light. Both the building and its records are still here, 142 years later. I can’t believe that today, I see in real-time, the celebration and revitalization of an idea created 151 years ago. I never thought, almost 30 years ago, that I would personally be connected to the Freedmen’s Bureau and the Freedman’s Bank. But the day is here and today I get to hear and see the official renaming of a building that will hopefully never be forgotten again. I have to thank the U.S. Treasury Department for not allowing fear to creep in and stop their efforts. I have to thank Operation HOPE and its founder, my husband, John Hope Bryant, for doing their part to encourage the Treasury Department to make this change, and to help educate the masses about the importance, relevance, and legacy of the Freedmen’s Bureau and Freedman’s Bank. Let us all do our part to make sure that this history is never forgotten, devalued, or diminished. Be sure that when you visit Washington, D.C. that you stop by the Freedman’s Bank and witness for yourself this powerhouse. If you currently live or work in the D.C. area then swing through there this week. Then think about the number of times that you have walked or driven past this building over the years. AME Church, AME Zion Church, economic development, economic empowerment, Emancipation Proclamation, February 7th 2016, financial dignity, financial empowerment, Financial Literacy, Freedman&apos;s Bank, Freedmen&apos;s Bureau, Freedmen&apos;s Bureau Preservation Act, Hampton University, Howard University, Jim Crow, John Hope Bryant, Natasha Foreman Bryant, Oliver Otis Howard, poverty, poverty eradication, President Abraham Lincoln, President Andrew Johnson, slavery, southern states, U.S. Treasury Department, Washington D.C.
Prev Post: My 2015 Year-End Reflection and Outlook for Next Year: I’m Coming in Strong!